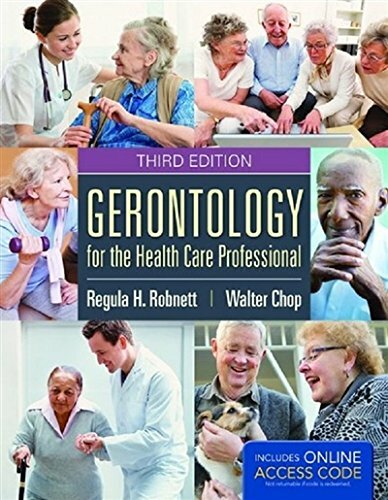 1284038874 -Gerontology for the Health Care Professional, Third Edition is a comprehensive, practical text covering the evolving field of gerontology, written for health care students and professionals. Written by experts across many health professions, Gerontology for the Health Care Professional, Third Edition presents an up-to-date and realistic view on the aging process. With topics presented in an introductory fashion, this book covers all the important aspects of aging and instills an appreciation for the multidimensional aspects of aging for those who are working with and caring for elderly patients or clients. Each chapter includes objectives, chapter outlines, cast studies, multiple-choice review questions, and learning activities. The Third Edition begins with chapters on different aspects of the aging process. Later chapters explore various issues that are of primary importance to the older population. This comprehensive, accessible text concludes with the future concerns of an aging society. There is also an epilogue encouraging all health care professionals to embrace patient or client advocacy, especially for older adults.